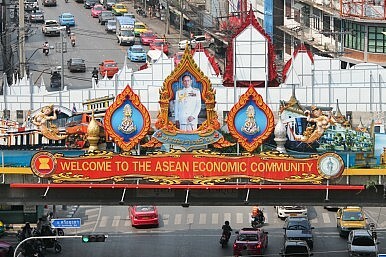 Who Will Benefit from the ASEAN Economic Community? Some civil society organizations are claiming that the community would excessively favor corporate interests. One of the major projects of the Association of Southeast Asian Nations is the establishment of an ASEAN Economic Community, which aims to integrate Southeast Asia’s diverse economies, a region with 600 million people and a combined gross domestic product of $2.4 trillion. But several civil society organizations are moving to postpone the AEC and calling for a rethinking of its framework, which they claim is biased in favor of corporate interests and the traditional elite. The AEC is defined by four pillars: Creating a single market and production base, increasing competitiveness, promoting equitable economic development, and further integrating ASEAN into the global economy. To synergize the region’s markets and production hubs, this would entail the free flow of goods, services, investments, capital, and skilled labor. Proponents argue that if the integration succeeds, the region could become the fourth largest economy in the next few years. But for Philippines-based think-tank Ibon Foundation, the current model of the AEC could further impoverish the poor while facilitating the “aggressive foreign corporate takeovers of the region’s resources.” It added that overall, the AEC is detrimental to ordinary people because it will lead to an erosion of sovereignty, diminishing access to social services because of a stronger push for liberalization and privatization, greater inequalities between and within ASEAN countries, skewed labor mobility, job insecurity, increased land and other resource grabs, and the undermining of local small-scale farmers. Ibon Foundation cited the investor-state dispute settlement provision of the AEC as an example of a one-sided protection measure in favor of corporate power, since it gives investors the right to sue government when their profits are in danger. During the ASEAN People’s Forum recently held in Malaysia, various civil society organizations signed a statement echoing the concerns raised by Ibon Foundation. “The liberalization of the labour market has increased the number of precarious jobs and will continue to adversely impact the rights of workers,” an excerpt from the statement. “Solidarity, cooperation and complementarity among states should be pursued instead of economic competition,” the group asserted. And since the AEC is not yet fully implemented, civil society groups are urging for a more comprehensive and democratic consultation with all stakeholders so that negotiations about the proposed regional integration will not be restricted to government parties. It is only by building a strong regional bloc with popular public support that ASEAN can successfully advance its agenda in the ongoing talks for greater economic cooperation in the Asia-Pacific such as the China-led Regional Comprehensive Economic Partnership and the US-led Trans-Pacific Partnership Agreement. The AEC concept is an important one, and is needed to boost the region’s economic potential. But to repeat the recommendations made by Ibon Foundation and other civil society groups, this AEC must be reconceptualized to genuinely empower the people. Thailand’s Inequality Challenge Looms Large Ahead of 2019 ElectionsCan ASEAN Economic Integration Succeed?What is the Future of Integration and Inequality in ASEAN?How Nationalism Undermines ASEAN IntegrationAs the World Turns Away From Globalization, How Should ASEAN Respond?